One rider scratched when it was determined that their horse was not descended from the Mearas. Arnethilt, Calebus, Galiodoc, Hologro, and Tinybel lined up at the start. The course tested the courage of each racer, requiring them to ride past ambushing orcs and through both orc and brigand camps. In the end, Galiodoc proved to be the fastest rider, followed close behind by Tinybel and Calebus. Many thanks to Rhunt, Mimerra, Lilanti, and Eulabelle for the wonderful music. 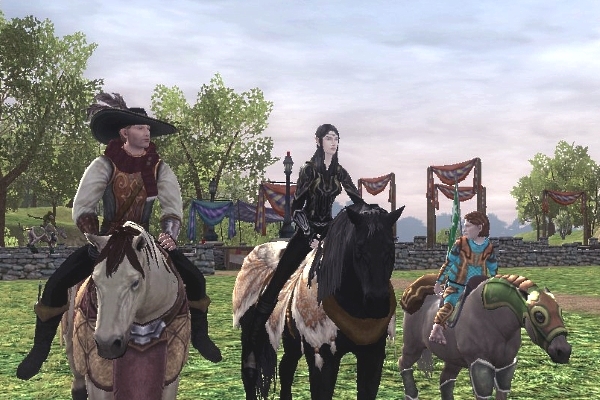 Special thanks to our bookie, Calycanthus, and our race course judges Lhinnthel, Byrcha, Bavelbella, and Kaerri. The day continued with the Hengstacer Stampede Rodeo. A large crowd assembled to hear Notenzauber and watch the first event, barrel racing. 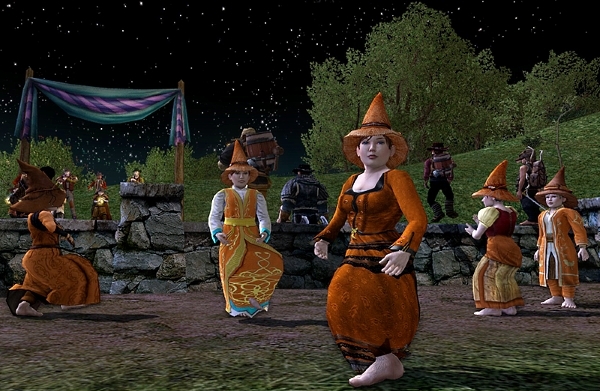 A pie-tin full of hobbits dressed in “safety orange” acted as the barrels. The riders had to gallop around the barrels in a special cloverleaf pattern without touching them. Each rider could try three times. The best times were Mellime (17.72s), Lainiest (18.16s), Tinybel (18.72s), Lhinnthel (18.75s), Calebus (18.80s), Rhunt (18.99s), Skoch (19.05s), and Ayelborne (23.74s). Of all the riders, Ayelborne and Tinybel showed the most improvement between runs. 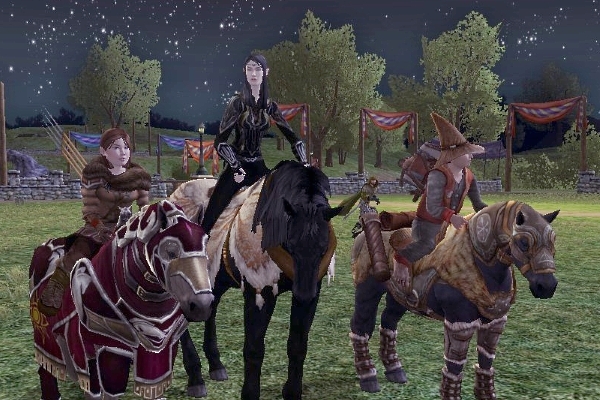 Many thanks to our adorable barrels – Audrieta, Bavelbella, Byrcha, Calycanthus, Elimraen, and Malvy. The next contest was Name-That-Song. The audience was challenged with identifying classic country songs. The first people to shout the correct answer scored points. If no one was able to guess quickly, hints were given. The contest featured songs such as Johnny Cash’s “Ghost Riders In The Sky” and Merle Haggard’s “Nobody’s Darlin’ But Mine”. Mimerra won the contest, with Angelhil only two points behind. Bruzo won third place. Special thanks to our band members – Palwyn, Harongol, Garbathol, Garbalas, Suzia, Sanneh, Skaldfinn, and Brico. The Stampede ended with a performance by the Rodeo Clowns. The comedy act featured a comedy skit, amusing jokes, and music with witty lyrics. The crowd showed their support with an abundance of laughter. Event volunteers took a break and joined the crowd for the carnival picnic. 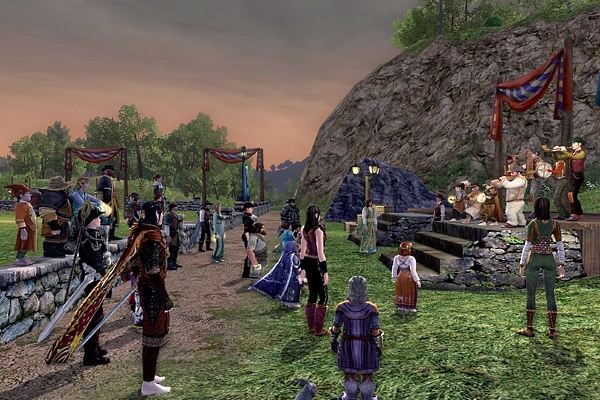 The Starlight Orchestra entertained the rapidly growing audience. Special thanks to TSO members Lilikate, Celebnal, Zygg, Palwyn, Corulin, Hollyberye, Bruzo, Lhinnthel, Pinesong, Zedrockk, Malvy, Nibun, Strawberrystar, and Emswise. 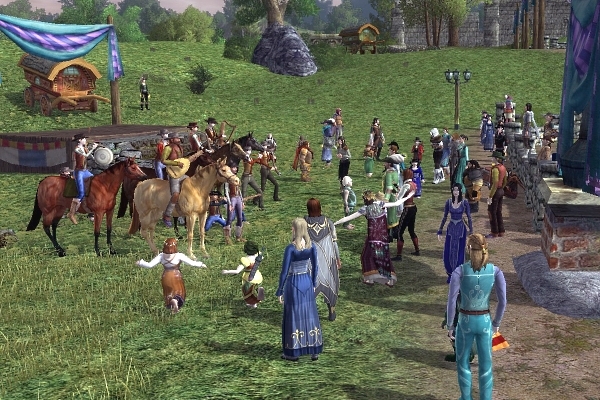 After the crowd enjoyed free-flowing ale, pipe-weed and snacks, it was time for the next event. The Windy Acres Ranch Formation Riding Team entered the field with a parade of impressive horse tack, while Kiralynn talked about equestrian history and trivia. Next, Lilikate’s Musical Creatures played a bit of Schubert’s Symphony while the riding team performed a complex quadrille dressage routine. The four riders guided their steeds in elegant unison. 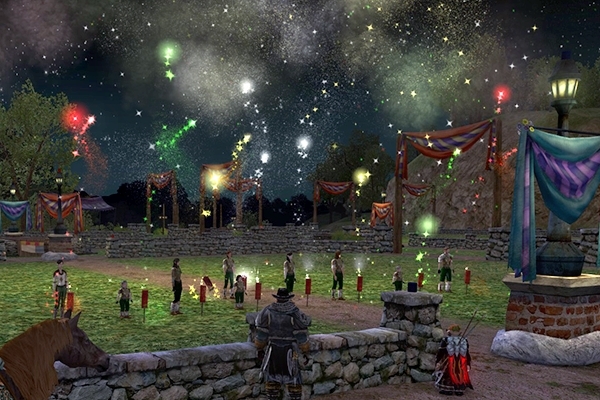 The riding team’s show ended with a coordinated fireworks show launched into the night sky by nine pyrotechnicians to a concert of popular music. 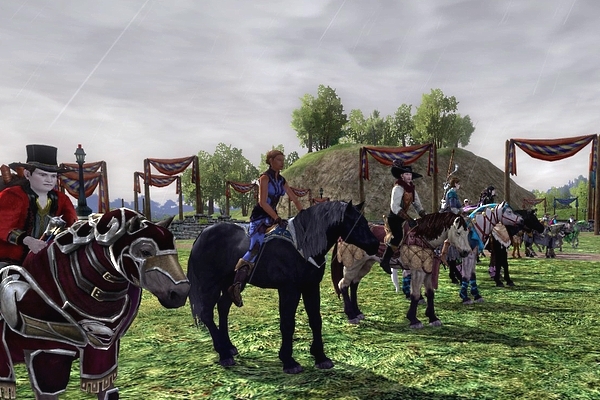 Calycanthus hosted the next event, a horse show open to the public. 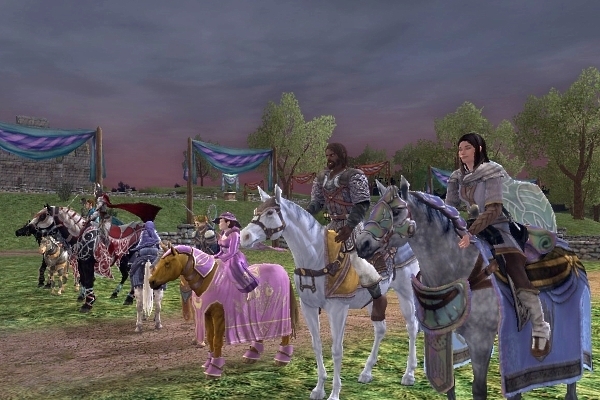 A dozen riders registered – Amarill, Ametistah, Caiyyd, Calebus, Haddy, Laerlin, Lainiest, Lindiria, Mellime, Seldim, Skoch, and Urshodan. The Musical Creatures entertained the crowd. A horse show is a mounted fashion contest. 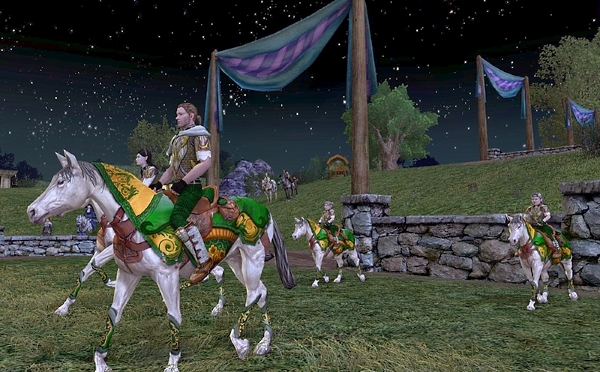 Each rider is judged on his outfit, steed, tack, and how well they all match. Each rider is given a short time to come out onto the field and impress the audience. There were many amazing outfits and voting was difficult. When the votes were tallied, Lindiria was the audience favorite. Mellime won second place, while Lainiest came in third. Eighteen racers were invited to participate in the Eriador Championship Cup. The main event started with a post parade. 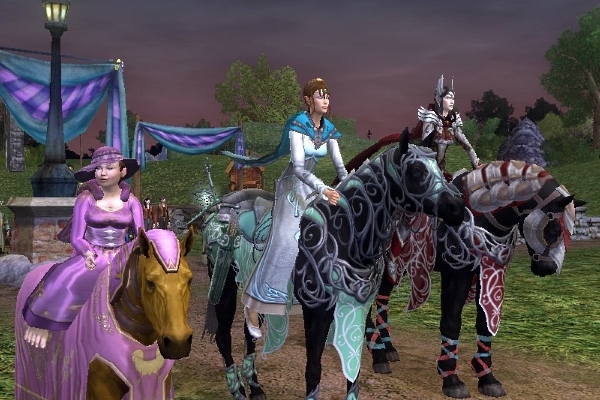 The final list of competitors included Breglas, Caiyyd, Calebus,Craicwyth, Galiodoc, Kaerri, Lainiest, Mellime, Nettlebow, Skoch, Tiora, Umpo, and Vethlo. Each racer was escorted onto the field by a pony rider while Kiralynn talked about their racing careers, strengths, and odds of winning. The Remediators gave an amazing pre-race concert. The excitement reached incredible proportions as the riders lined up at the start. Veteran racers faced off against newcomers to the sport. 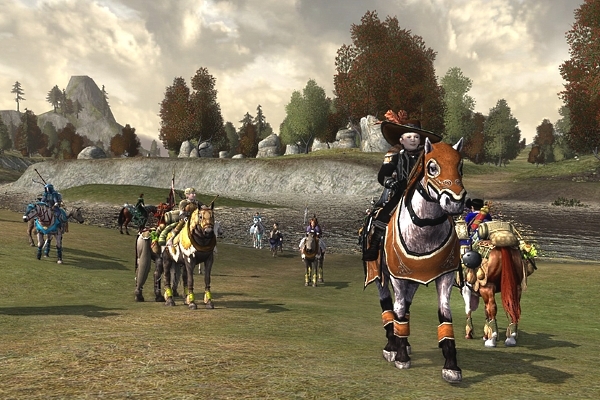 The war steeds anxiously pawed the ground as the riders waited for the signal that would start the race. 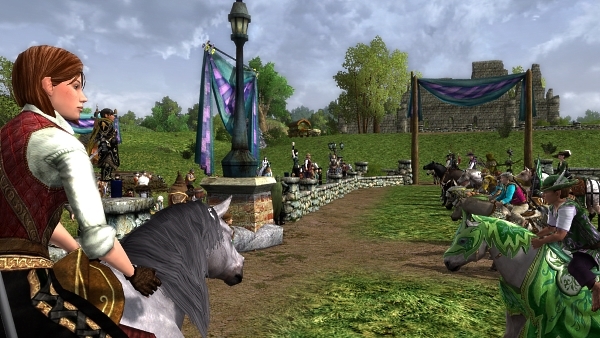 With a shout and a thunder of hooves, the race began. 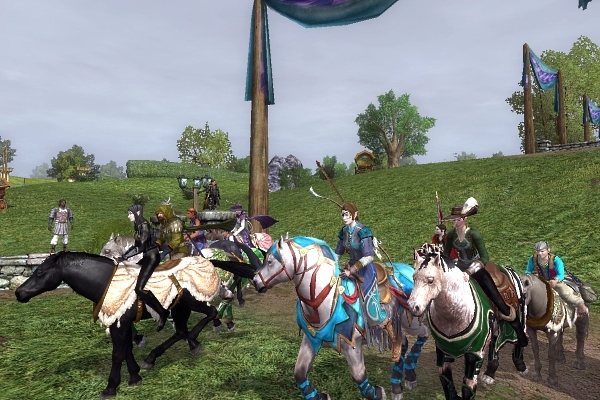 The course was the longest of any championship race, taking the riders through the northern Bree-fields, Far Chetwood, Weather Hills, and Andrath. All six checkpoints were located in seldom visited ruins. There were several challenging obstacles. The first was a cliff overlooking Starmere Lake, where one rider didn’t turn sharp enough to avoid a plunge off the cliff into the rushing water. The second was a narrow stone bridge at the bottom of a steep, winding path in the Weatherway. Riders had to navigate the treacherous mud and deceptively shallow water of Midgewater Marsh at the Woodsedge Ruins. At the finish line, the crowd gathered and watched the western horizon. There were murmurs and cheers as news came in from each of the checkpoint judges. Finally, the first war steed galloped into view. Lainiest was first across the finish line, greeted by the enthusiastic roar of the crowd. Craicwyth, an early leader in the race, finished second. Nettlebow was not far behind, winning third place. 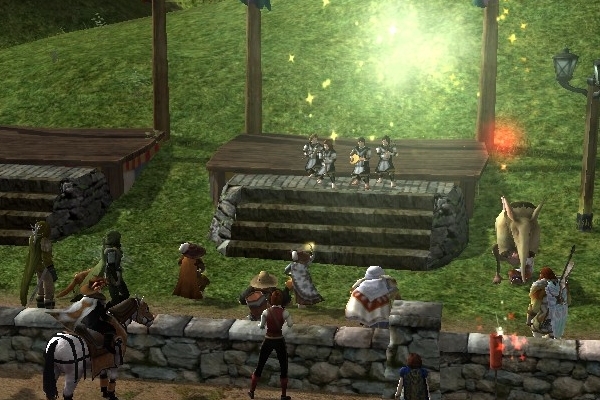 The band played a triumphant song and the sky was filled with fireworks as Lainiest was crowned the fastest horse racer in all of Eriador. Many thanks to The Remediators for the amazing race music. Special thanks to our course judges and bookie – Byrcha, Calycanthus, Corulin, Dannigan, Hollyberye, Lhinnthel, and Valtharon. With the crowd still celebrating the championship cup horse race, The Remediators kicked off a two hour concert. There was beautiful group dancing, enthusiastic drinking, and quite a bit of gossip about the day’s events. 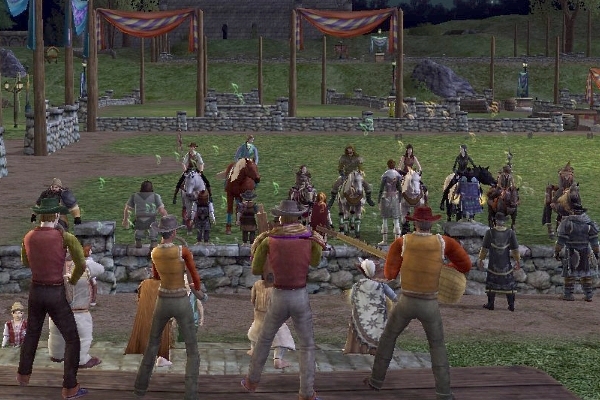 Finally, it was time for the audience to join in the equestrian fun. 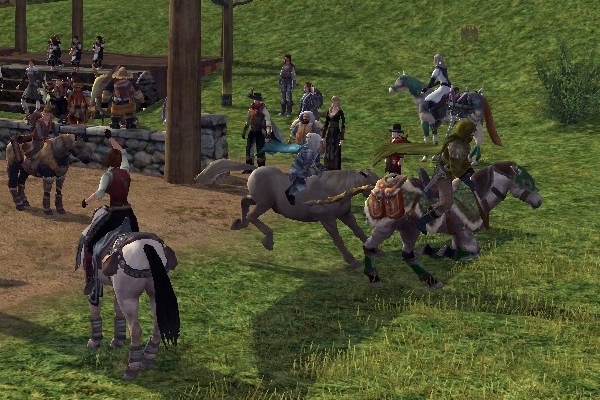 Byrcha led everyone on the Wild Ride, a fast-paced romp from Bree-land to Rohan, enjoying the scenery while hunting war bands and roving threats along the way. 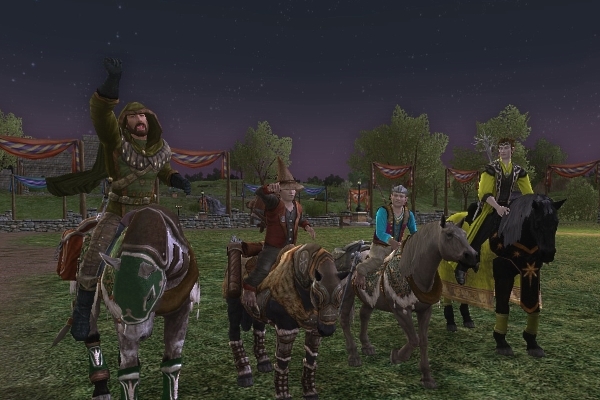 Congratulations to this year’s winners – Thorin’s Cup: Mellime, Tiora, and Lainiest. 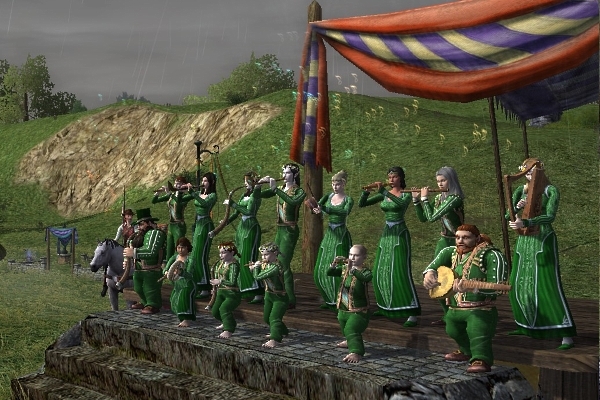 Rivendell Cup: Craicwyth, Caiyyd, and Umpo. Bounder’s Cup: Nettlebow, Skoch, and Vethlo. Bree-land Cup: Galiodoc, Tinybel, and Calebus. Barrel Racing: Mellime, Lainiest, and Tinybel. Name-That-Song: Mimerra, Angelhil, and Bruzo. Horse Show: Lindiria, Mellime, and Lainiest. 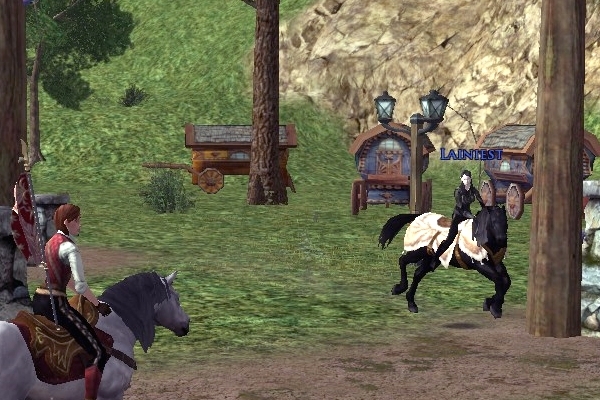 Eriador Championship Cup: Lainiest, Craicwyth, and Nettlebow. I would like to thank all of the people who generously donated prizes for the SRC events, especially Frelorn, Community Manager at Turbine, who donated many of the Turbine Point and Starter Pack codes. To the volunteers – thank you for the time and work you gave during twelve hours of amazing events. The community is fortunate to have people like you. Your music, jokes, posters, tweets, video streams, and screenshots were amazing. Horse racing wouldn’t be possible without you. Happy adventuring and we hope to see you at the races!